April/May the refurbishment was undertaken to take the pitch from the old sand-filled base to the new 3G surface which can be used for football or touch rugby. The project was funded by Three Rivers District Council along with Hertsmere Leisure Trust, a registered charity. Hertsmere Leisure are managing the facility on behalf of Three Rivers District Council. The contractors for the works were Nott’s Sports and Charles Lawrence surfaces. I would like to thank Hertsmere Leisure for arranging the opening day. 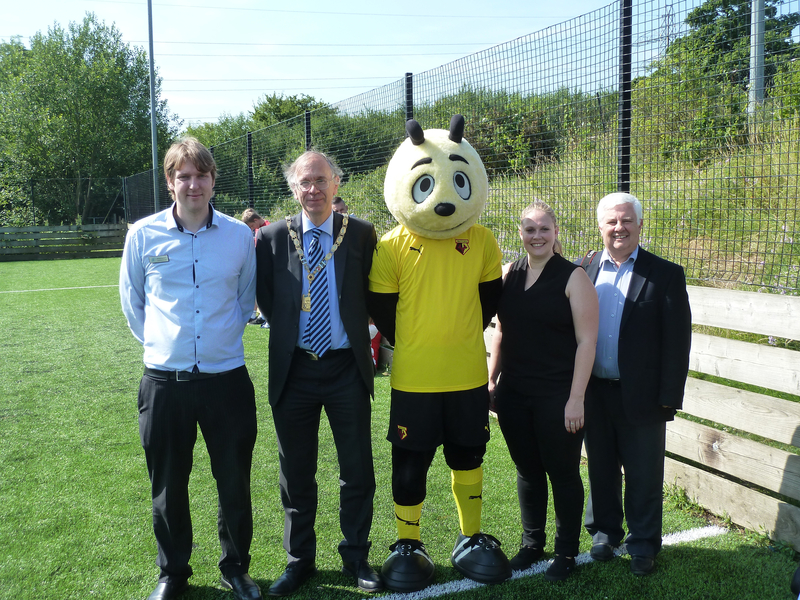 And thank you to Watford FC for supplying Harry the Hornet (mascot) and coaches for the morning’s activities and Kelly Barnard from Three Rivers Council. Along with the children and young people I can now say that I have scored a penalty against Harry the Hornet having sent him the wrong way. The coaches from the Watford FC and their Community Sports and Education Trust organised coaching and then a series of matches on the two pitches. Three Rivers Councillors who supported the event were Eric Bishop (Vice Chairman of the District Council ), Alison and Andrew Scarth (Ward Councillors from Oxhey Hall and Hayling). “I love James Altham” a child on being given a bottle of water.